The modern shepherds hut - Why they are becoming popular once again? The Modern Shepherds Hut - Why are they becoming popular again? The invention of the secure steel shipping container caused the decline of the Docklands in central London. At the start of the 1950s the docks were a hive of activity but by the early 1970s large areas of the docklands were standing derelict. The freight that the central docks used to handle was now taken by the new deepwater ports of Felixstowe and Tilbury. The simple idea of transporting goods in secure metal containers of standard size meant that the large ships that were needed to transport these new containers could not make it up the river Thames to the Port of London. The steel containers protected the goods from the weather so the warehouses were not needed either. As we found in the previous article about traditional shepherds huts a similar change in technology during the 1920s was the reason behind their decline. So why are shepherds huts becoming popular again? Before we find out reasons why shepherds huts are becoming popular once more lets take a look at a modern hut to find out how it differs from its traditional ancestor. This particular wheeled hut is located in rural Worcestershire and has the traditional cast iron wheels and undercarriage recovered from a severely decayed shepherds hut recovered from an old farm yard. The external cladding is the traditional corrugated steel with a curved roof. The draw bar for this particular example is removable and is stored in a separate location for security of the hut. Traditional huts were supplied with removable draw bars too. The supply of a draw bar in ash was an optional extra which, in 1894, added an additional £5 to the purchase price of just over £16. From the outside the modern hut looks like its original ancestor. The oak frame to the modern hut has 100mm of insulation. Insulation was not something that was ever used in the old style shepherds huts. Given the building standards and types of insulation used at the time may have been one of the reasons for the longevity of many sheds. Traditional insulation would have retained moisture and promoted rotting in the traditonal style of construction. There is the traditional split stable type door but the hinges are of a very high quality and the doors have rubber seals to keep out any potential draughts. The windows are double glazed, double glazing had not even been conceived of in the hey day of this type of structure first time around. There is an oak floor, cot bed, a couple of chairs and a fold down table. 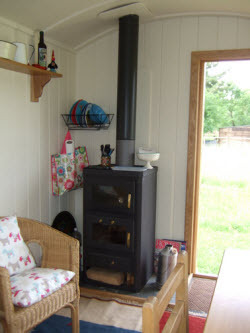 The hut is heated with a woodburning stove that incorporates an oven for cooking if needs be. All up the whole kit and caboodle weighs in at about 3 Tonnes. Moving the hut can be achieved using a fairly standard 4x4 when the weather has given the ground a chance to dry out. Siting the hut takes a bit of care as unlike a modern caravan there is no built in facility to level the hut. If the hut is to be moved its new location needs to be chosen so that it is level. OK So the modern shepherds wheeled hut has improved levels of comfort. 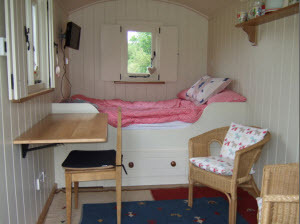 But is the improved level of comfort the driving force behind the popularity of the shepherds hut? There were several factors that needed to be in place before the derelict industrial area could rise again. These were the planning framework, transport infrastructure and of course tax incentives. Today the area is a thriving commercial and residential area. Getting planning for a new extension or additional buildings in rural areas of the UK is an expensive and time consuming exercise. 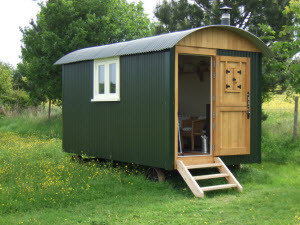 A shepherds hut has wheels and is mobile so is covered by a set of planning regulations that are more relaxed than the permitted development rules that govern the construction of sheds and outbuildings. Despite some price reductions, and some inflation, property prices are still at a historically high level. Property transaction taxes also mean that moving is an expensive proposition. If you need extra space then a shepherds hut can be a great addition to the garden if you have the right size garden. Also, unlike a caravan for instance, the level of depreciation is low, secondhand huts do seem to retain their value. The invention of the internet and mobile computing means that homeworking is an evergrowing trend. With the advent of wifi connections the office does not even have to be in the main house so working in a shepherds hut is not only attractive but feasible. The hut that I saw had electric power but was not connected to the mains. The increasing efficiency of light weight solar panels mean that mains supply power cables are not required. This hut had its own independent power supply, powered by the sun. Things were always simpler in the past right? You might yearn for the simplicity of the shepherd in his hut with only his flock to tend to. I would rather that it was the modern variety of hut that I had to return to at the end of the day with its insulation and double glazing than the draughty cold one of days gone by.